WEEK IN GEEK: Andrew plays Overcooked! with Taylor Katcher while Dan watches Crazyhead on Netflix. “Phoenix-based Comic Con Now Makes People Pay to Be Volunteers” by Beth Elderkin via io9. UPDATE: Square Egg CEO and Phoenix Comicon director, Matthew Solberg, has resigned his position on the board of the Blue Ribbon Army. 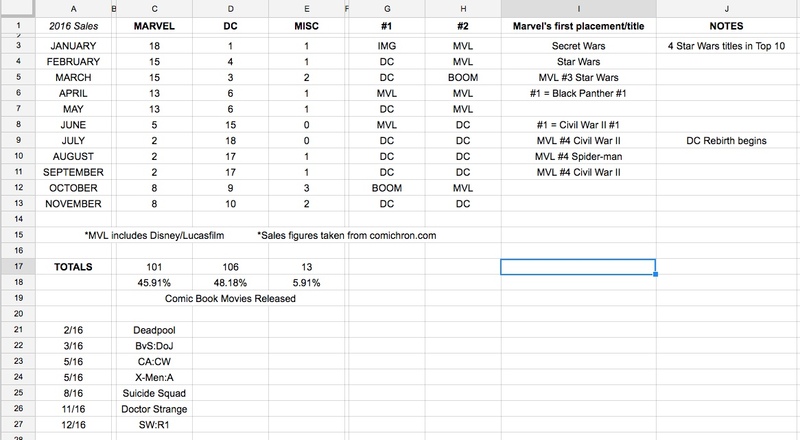 MINDING THE NUMBERS: In a Bleeding Cool article covering December’s comic book sales numbers, Andrew and Dan dive deep into 2016 sales by Marvel and DC and compare their respective performances and draw some interesting (if very not scientific) conclusions from the data.